Beyond the fact that what some call hate speech is usually protected by the First Amendment, this characterization is particularly interesting in light of the installation’s context. The work is part of a larger exhibit from the university’s interdisciplinary TransMedia Narratives program, which brings together students studying art, psychology, game modeling, writing, graphic novels, web development, and video production to create thematically linked projects. 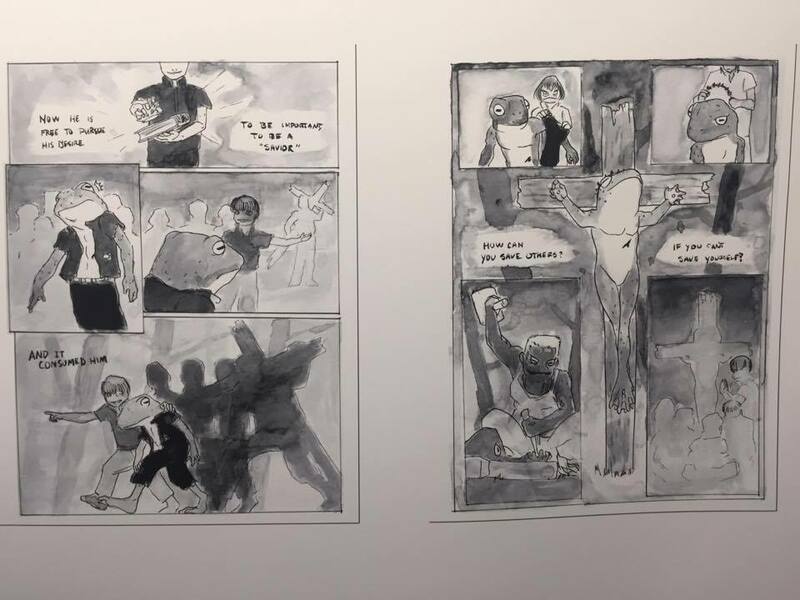 Smith created the work to accompany a graphic novel which students, including Smith, collaborated on. 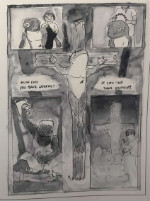 The installation reflects one of the final scenes in the graphic novel, when a “man of the church,” who is slowly transforming into a frog as he pursues a selfish quest to become a savior in his own right, is crucified when the metamorphosis is complete. While the artist’s intent does not negate the feelings of the protestors, this is a prime example of how one person’s “anti-Christian hate speech” can be another person’s morality tale laden with Christian themes. 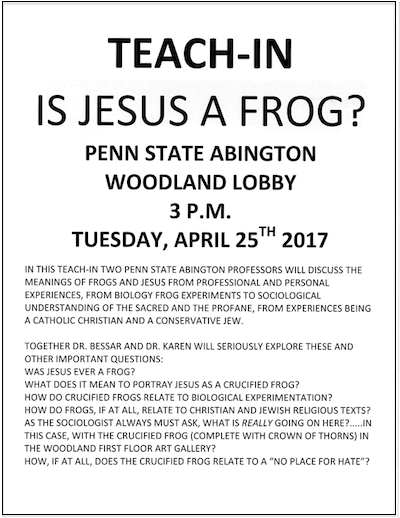 We are deeply proud of how Penn State Abington has handled this controversy. Our administration has not censored artistic expression, those with divergent opinions of the work have been given opportunity to air their concerns, and the dialogue that has followed remains civil, respectful and deeply engaging, a positive educational experience we did not plan and could never artificially create in the classes we teach. FIRE applauds Penn State Abington for cultivating a productive discussion around Smith’s exhibit without resorting to censorship of either side. This is the “more speech” approach at work, and it dovetails nicely with the educational role of the university. Other universities that have faced similar controversies could learn from Penn State Abington’s example. This April, FIRE also wrote to the University of New Hampshire to protest the removal of a student’s anti-sexual-harassment exhibit, which displayed statistics on street harassment and real-life examples of catcalls directed at survey respondents. And just this month, controversy hit Temple University when a professor and chair of the Africology and African American studies department successfully called for the removal of a painting by African American artist Jennifer Cruté, arguing that some faculty and students were “upset” by the artwork and found it “insensitive.” The artwork was originally part of an exhibit to critique how “Black bodies are specifically represented to children” according to Douglas Greenfield, the associate director of the Intellectual Heritage Program at Temple’s College of Liberal Arts. [A]rt has historically served as a critique of its environment, whether religious, political, or interpersonal, in an attempt to enlighten the audience. I’m reminded of Francisco Goya’s The Third of May and Picasso’s Guernica and the impact they had in exposing the horrors of war. Art takes many forms but has always served a higher purpose than to look pretty. The protest at Penn State Abington and the response from the university should serve as a model for how universities should respond to controversies over artistic and political expression. Despite disagreements about the intent, effect, and message conveyed by the installation, the best response is to facilitate discussion, rather than oblige calls for censorship.